Are cryptocurrencies the new gold and silver? What is a Gold IRA? Gold IRA GuideInvesting Can I Hold Gold and Silver Coins in My IRA? Can I Hold Gold and Silver Coins in My IRA? The short answer to this question is yes, it is possible to hold gold and silver coins in your IRA. However, to do so, it is generally necessary to establish a so-called Gold IRA, one which allows you to purchase physical gold and silver as opposed to only permitting gold and silver stocks and ETFs to be held. A Gold IRA is one in which the custodian allows you to purchase physical precious metals including gold, silver, platinum and palladium, in your IRA. The typical IRA is not set-up to allow these types of investments, hence the use of the term Gold IRA to refer to those IRAs which have the capacity to hold physical precious metals on your behalf. Please note that while these IRA accounts will allow you to purchase gold and silver coins and other approved precious metals, they must be kept within the IRA and not in your possession to comply with applicable IRS regulations. Instead, your IRA custodian will designate a licensed depository to hold the precious metals on your behalf. What types of silver and gold coins can be held? Certain types of gold and silver coins have been designated as acceptable to be held in an IRA. These are typically proof coins that have gone through a special minting process using certain designated dyes. To make these proofs, coin blanks are deposited into presses and struck a number of times to create detailed coin images above a translucent background. The issuance of proof coins in any one year or month is typically limited by the mints supplying them. The prices of these coins typically reflect a variety of variables in addition to the current prices of gold and silver, namely, the condition of the coin, mintage, scarcity of that particular issue, age, and demand. Given their appeal as collector’s items, these coins will often fetch a premium over their bullion value, depending on market conditions at any given time. Gold coins: American Eagle coins; Australian Kangaroo/Nugget coins; Austrian Philharmonic; Canadian Maple Leaf coins; US Buffalo Gold uncirculated coins (no proofs of this type are allowed). Silver Coins: American Eagle coins; Australian Kookaburra coins; Austrian Philharmonic coins; Canadian Maple Leaf coins; Mexican Libertad coins. With the price of gold and silver experiencing significant volatility lately, first plunging and then recovering somewhat in value, the lower prices on these precious metals that have resulted have led to an upsurge in the purchase of physical gold and silver instruments such as gold and silver coins recently. This, in turn, has led to premiums over the spot price rising for some types of silver and gold coins. Whether these premiums will continue to rise over time or will back off is hard to predict, however, they do signal a tight market for physical precious metals currently, and are something to keep an eye on if you are planning to purchase gold and silver coins in your IRA. ...before requesting this free PDF guide. The information contained in this guide can help you save thousands of dollars in hidden fees and commissions. It's a must-have. David has a bachelor in Economics and an extensive financial background. He is CFP® professional which means that he is an expert in investment and retirement planning. David enjoys covering current geopolitical world events and topics that relate to the U.S. economy. Sign up to receive our FREE monthly newsletter to get recession-proof investment and retirement tips. Sign up now and we'll send you a free copy of our 20-page PDF report entitled "5 scams to avoid when investing in bullion gold & silver"
"Gold will be the great investment over the next decade." "If this business was as easy as it sounds, all my branch managers would be setting up their own gold loan companies." "The U.S. dollar is very weak. Investors are moving to real assets." "There is a massive shifting of wealth to new economic powers." "The system is not working properly." "I have never been a gold bug, it is just an asset that, like everything else in life, has its time and place. And that time is now." Want to speak to a Gold IRA Specialist? © Copyright 2019 Gold IRA Guide, Helping You Invest in Gold Through Your IRA. FTC Disclosure: we are a professional and independent site that aims at providing valuable information for people interested in retirement investing. Our content does not constitute financial advice. You are encouraged to talk to your financial advisor before making any investment decision. Also, in order to meet the running costs of this blog, we do receive compensation from ads and banners you see on the site. We also receive compensation from leads we refer to external companies. Worried about the Economy? Inflation? National Debt? Money Printing? Currency debasement? Join our Newsletter and get expert recession-proof investment tips straight to your mailbox, completely free of charge! 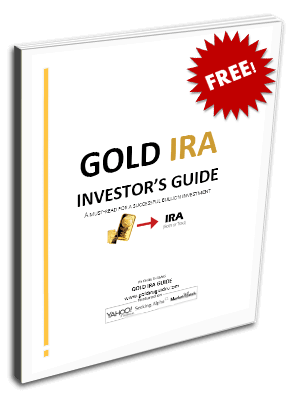 Join now and get a copy of our free PDF guide that will teach you everything you need to know about Gold IRA investing. Valid email address required. Your information will never be shared or sold to a 3rd party. We only send out emails once a month. You can unsubscribe at any time.